Ghost stories are always intriguing to me. I guess because of all the creepy, paranormal entities out there, ghosts are the most realistic to me and because of that they scare me more than any other type. This story is about Cassie Quinn and her family. They recently moved to a creepy old house in a small town and there are a lot of weird things that start happening. 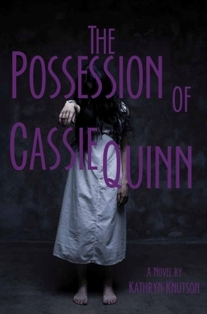 At first Cassie blames her new stepsister for the weird messages and things she sees, but pretty soon it becomes obvious that something a little more sinister is going on. Not to mention, her new friends definitely have an issue with her house and the woods behind it, and she can tell they are hiding things from her. This was a creepy and quick read. It's chock full of tricky apparitions, paranormal experts, amulets, spells and scary treks through the woods at night time. And just as you think things are starting to get under control, there is a twist at the end that sets up some great things for book two. This is definitely one to pick up if you are the mood for a little bit of a scare. Hmm, I actually hadn't heard of this one before. I'll have to add it to the TBR.